This meant that I will be spending the next week living off of the clothes and toiletries that I had in my carry on luggage. Jennifer saved me on this one because she made sure that I packed a variety of clothes "just in case" this happened. Thanks babe! 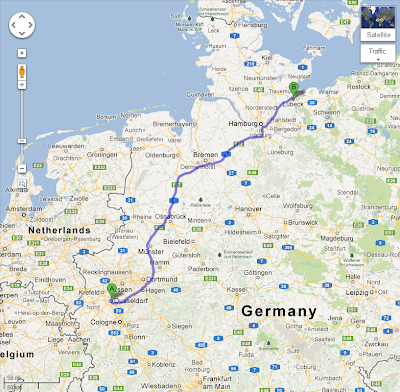 Dariush picked me up around 9 am and we began our journey to Lubeck to see his family. 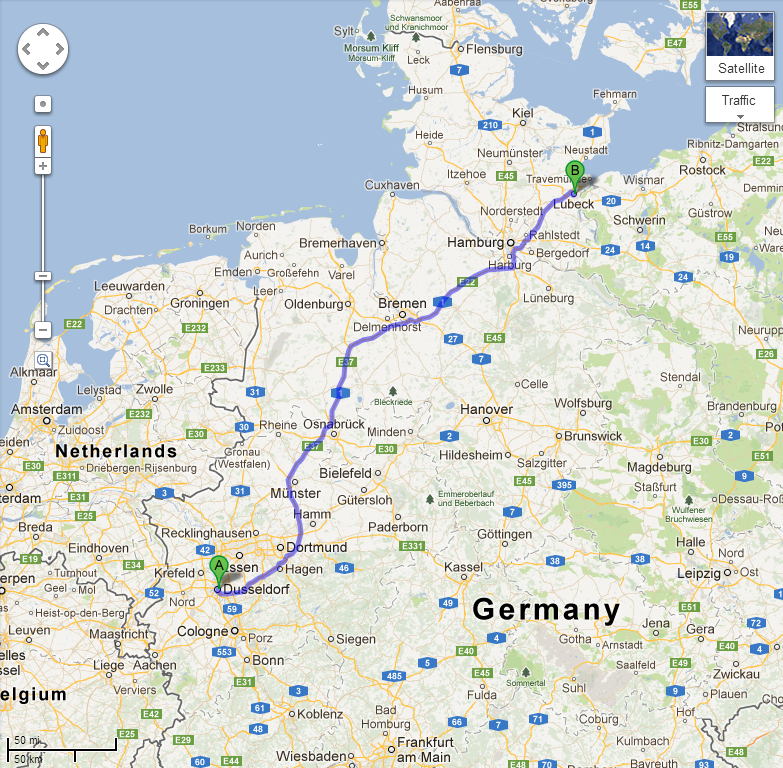 The drive was about 4.5 hours from Dusseldorf and we had a great time together. It was unfortunate that I didn't get to see Rita, Nouchine, and Jonathan, but the plan is for me to spend the day with them on Saturday. They had a small birthday party planned for me yesterday (ie. Sunday), but due to my flight problems I wasn't able to attend. Knowing the Ghobads, I'm sure they still had the party without me. :) Thank you so much for the thought guys! It means a lot to me! For the first 3 hours of the drive up to Lubeck, I was able to keep conversation with Dariush, but after we stopped for pancakes, I found myself slipping in and out of sleep while he drove. We arrived in Lubeck around 2:30 pm and I went directly upstairs for a long over due "power nap". Dariush woke me around 4:15 and we walked around Lubeck for a "pre tour" of his hometown. It is a very old city with lots of natural beauty built into it's historical structures. After our walk, we arrived back at his house for a wonderful dinner prepared by his mother. It was an Iranian dish with eggs, tomato sauce, rice, chicken, and egg plant. It was absolutely delicious; I had a large second helping. After dinner, we all sat around and enjoyed each others company for a few hours. I shared pictures of the girls with Ursula (Dariush's mother) and Christina (close family friend). They told me many stories and I learned a lot about Dariush's past and up-bringing that I'd never knew before. I had a great time today, and I'll remember the details of my short evening here for many years. Very often there arise such situations when upon arrival to the destination you find that you have a lot of problems with the luggage that did not come with you.